Amazon released an official Prime Video app for Android TV last month, but you couldn't actually install it on anything. The app was (and still is) marked as incompatible for every Android TV device on the market, so no one can actually use it yet, and there's no APK available. Now the situation is even more confusing, as Amazon has enabled Android TV devices to download the normal Prime Video app. 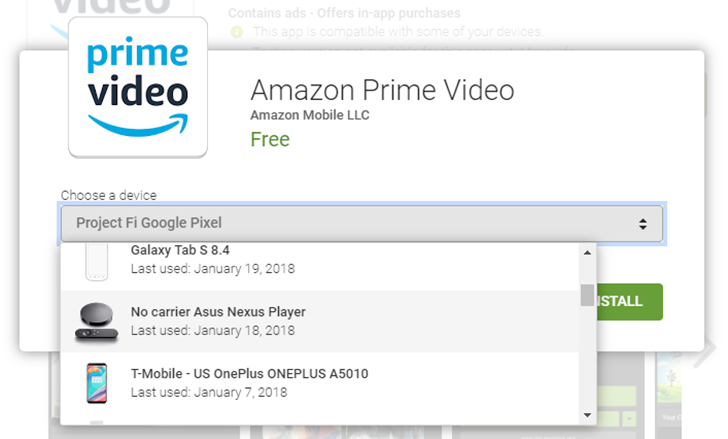 The Play Store listing for the normal Prime Video app now shows as compatible with the Nexus Player, Nvidia Shield, and other Android TV devices. However, this seems to be a mistake on Amazon's part, since the app doesn't actually work on TVs. It doesn't appear in the default launcher, and you can't select the "Getting Started" link that is required to use the app. In other words, the actual TV app for Prime Video still can't be downloaded, and the phone version is available but completely broken on TVs. Good job, Amazon.